The spirits of the group have been crushed after the discovery of an infected Sophia Peletier. Everyone stands in shock at the sight of the little body in the dust. 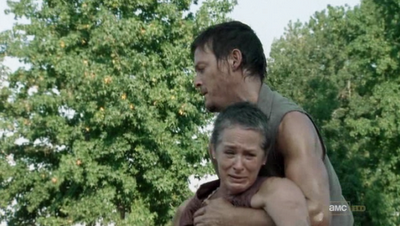 Daryl turns Carol around, refusing to let her look at her daughter's body. 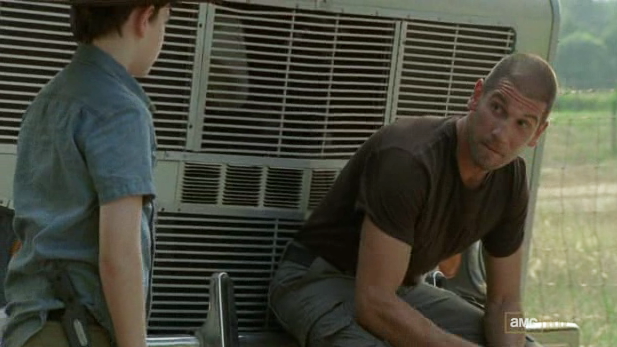 Shane confronts Hershel, accusing the old man of withholding Sophia's whereabouts. 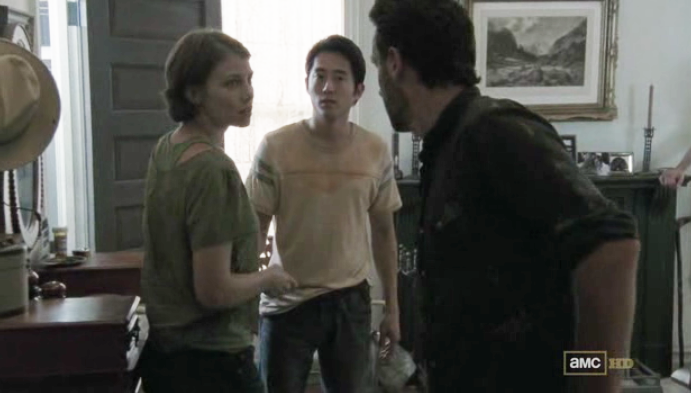 An angry confrontation unfolds and Maggie ends it by slapping Shane in the face. 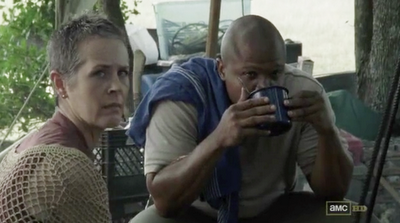 As the Group digs graves for Sophia and Hershel's family, Daryl keeps Carol company in the RV. Her refusal to attend Sophia's funeral both confuses and hurts him but he still attends in her place. 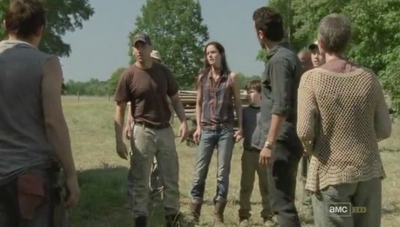 Hershel flees the farm and heads for Hatland's, the local bar. Rick and Glenn leave to bring him safely back to the farm. Nearly hysterical after the loss of her mother, Beth Greene collapses in the kitchen. Realizing that the girl needs medical attention, Lori finds Daryl to ask him to go into town and urge Rick and Glenn to return with Hershel. Daryl is furious at Lori giving him orders after the loss of Sophia and he tells her to do the task herself. 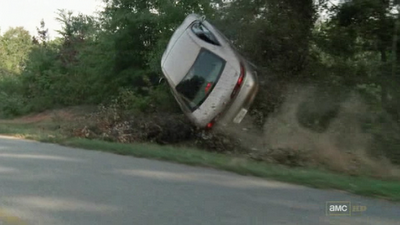 She takes Maggie's car and promptly rolls it into a ditch in an attempt to avoid a Walker staggering in the road. 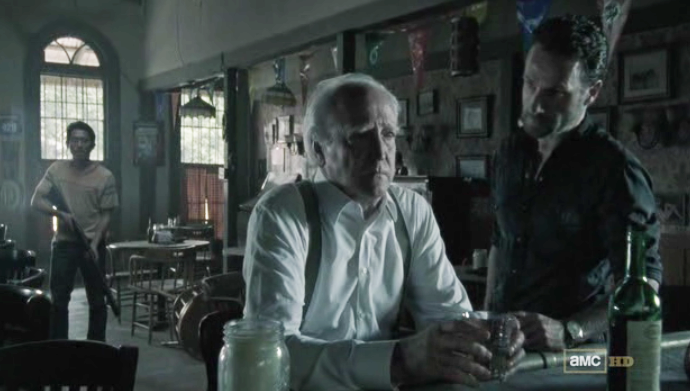 Rick and Glenn find Hershel drinking himself into a stupor at Hatland's bar. Hershel apologizes for his foolishness and just as the three are about to leave the bar, two strangers arrive. 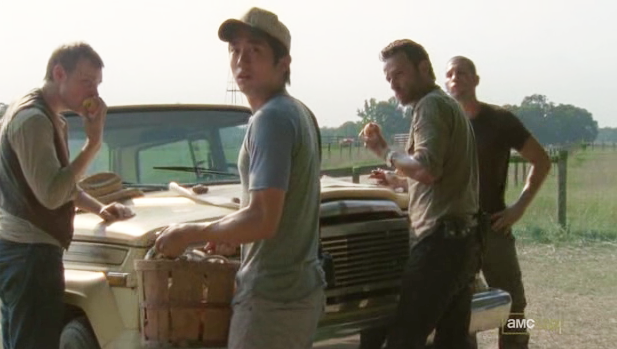 Introducing themselves at "Tony" and "Dave," the two men quickly become antagonistic; demanding that Rick and the Group reveal the location of the Greene farm. 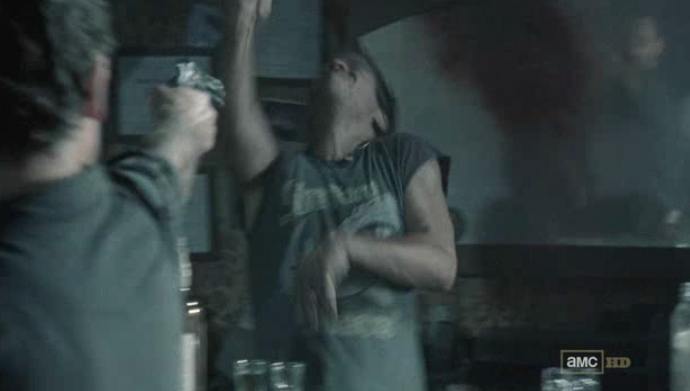 In a move that is seemingly out of character, Rick opens fire on both men. Though stunned, Hershel and Glenn do not disapprove of his actions. 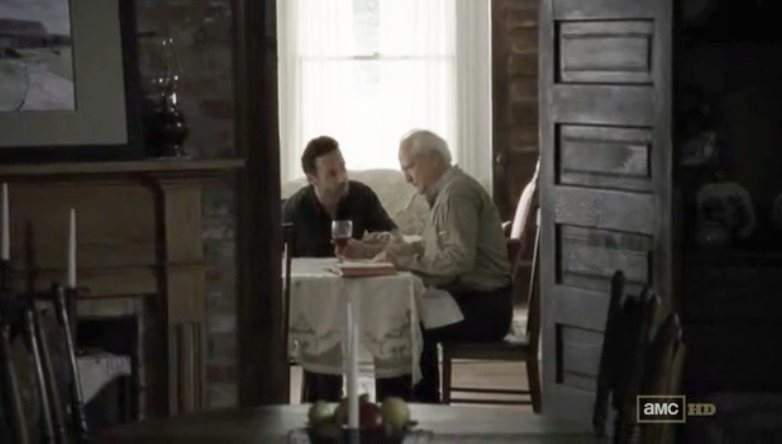 With the close of an emotionally devastating day, Dale would not want to intrude on the grieving Greene family to prepare a meal. He would create the quick and easy, RV There Yet? Casserole for the Group. Protein-rich from the beans and spiced just right, this casserole is delicious, easy, nutritious and filling. And when the dead rise; don't take any crap from Olive Oyl. In a large Dutch oven, heat a tablespoon of oil over medium heat (or medium coals) . Add onion, garlic and pepper and saute lightly for 5 minutes, or until softened and the onions are transparent. 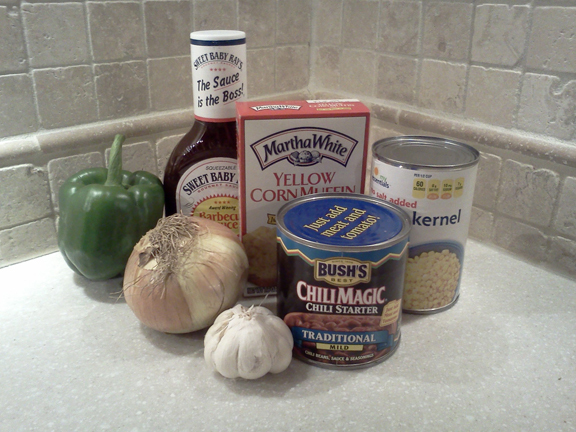 Stir in chili beans, corn, barbecue and sauce. Simmer for 10 minutes or until vegetables are soft. Prepare corn muffin mix with water as directed on the package. Pour over bean and barbecue mixture. Place Dutch oven into preheated oven and bake for 30 minutes or until knife inserted in center of corn mixture comes out clean. 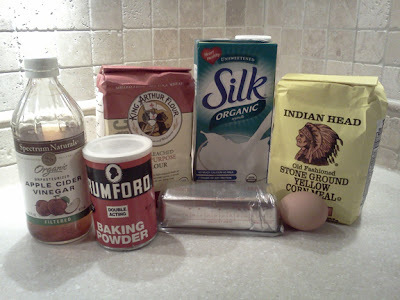 Alternately if you do not have an oven, add an additional 4 tablespoons of water to corn muffin mix. 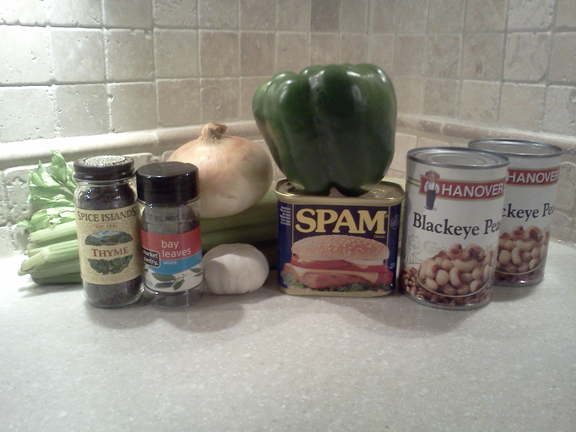 Drop by tablespoons (like dumplings) into bean and barbecue mixture. Cover tightly with lid and simmer gently for 20 minutes or until "dumplings" are tender and shiny. 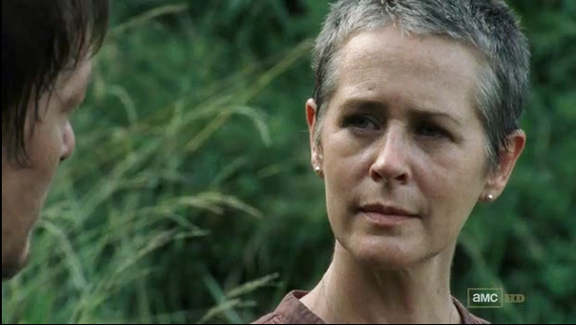 Even before the Apocalypse, Carol Peletier's path had not been an easy one. 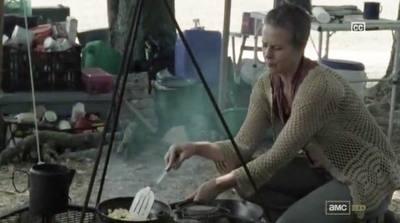 As the abused wife of the loutish Ed Peletier, she focused all her energy on trying to raise her daughter Sophia. When the herd attack on the quarry survivor camp cost Ed his life, she took the pick-axe from Daryl Dixon and inflicted the debilitating brain injury to stop the reanimation process. When she performed the task with gusto, Daryl immediately knew her history mirrored his own. After the herd separated the Group on the highway and Sophia was lost, Carol had to be held down as she tried to run into the woods to protect her daughter. 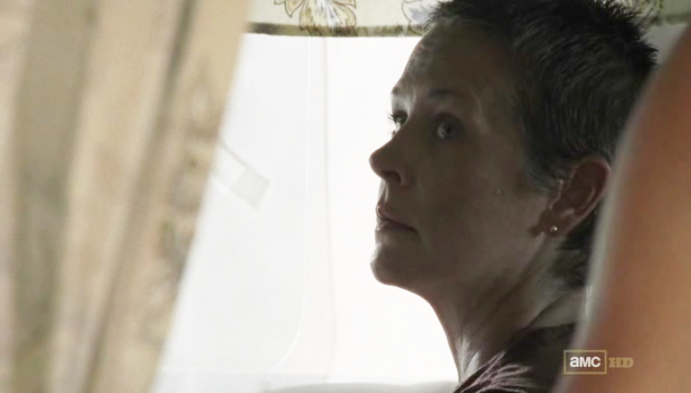 The search dragged on for weeks and as Carol's hope faded, it was Daryl's strength of belief and the gift of a Cherokee rose that bolstered her spirit. She returned the kindness and told him how he had done more for Sophia in one day than Ed ever did in his life. As the reality that Sophia was likely dead sunk in, Carol tried to stop Daryl from risking his life further. 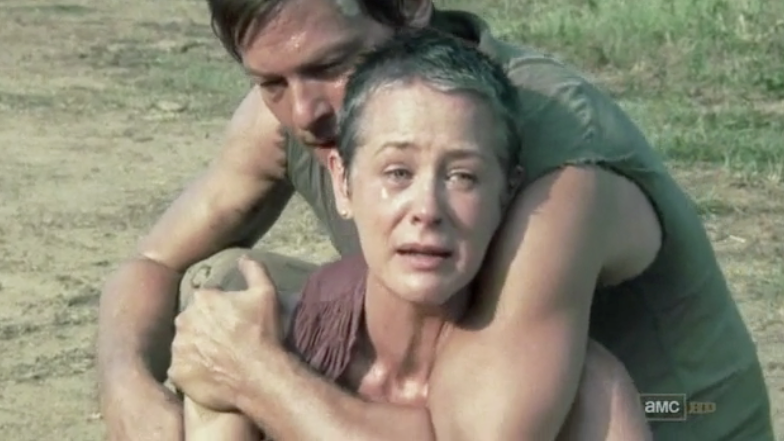 Finally, when a transformed Sophia emerged from the barn, it was only Daryl's quick thinking that prevented Carol from running to her undead daughter. Rick put down the little girl when no one else could. And having accepted Sophia's death as happening a long time ago, Carol refused to attend her funeral. 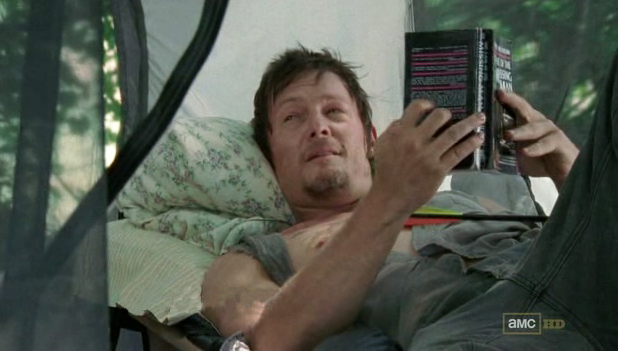 Though Sophia was lost, Carol had found a kindred spirit in the coarse Daryl Dixon. As unlikely allies, the two have a complex understanding of each other that the rest of the group cannot share. The WDSCB presents Olive Oil and Almond Cake in recognition of Carol Peletier and her daughter Sophia. Inspired by a famous almond cake named for actress Sophia Loren, this unique and subtly flavored cake is far more complex than any butter based cake. Olive oil creates a rich texture and almond paste imparts an unusual flavor. Two unexpected ingredients combine to create something truly magical. Preheat oven to 350° or heat campfire coals to medium embers. Grease and flour a spring-form pan (9 or 10 inches). Cream together oil, milk and sugar. 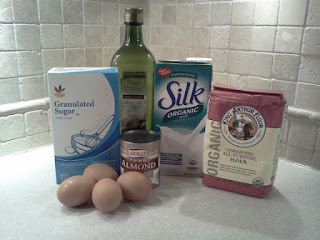 Add almond paste. You will need to use a potato masher to break up all the lumps. It may not be possible to get batter completely smooth without an electric mixer. Add the eggs one at a time and beat well after each addition. Add flour and baking powder mixture. Pour cake batter into prepared pan and bake for 45 minutes or until cake is lightly browned and springs back when touched. Alternately for campfire cooking, place over medium coals. Cover with lid or cookie sheet. Place additional hot coals on top of lid or cookie sheet. "Bake" as directed, checking after 20 minutes. Rotate if needed and continue baking until golden and spongy. Cool and slice. 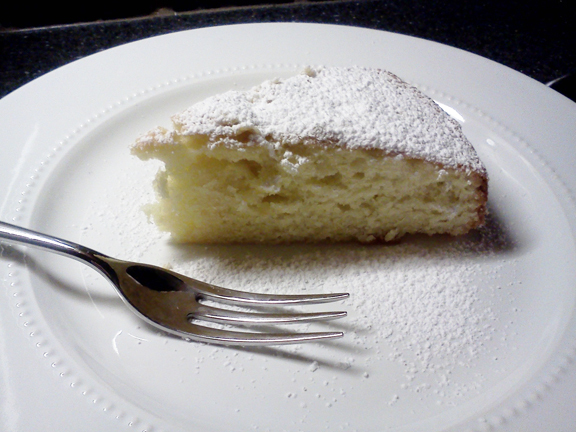 Sprinkle with powdered sugar if desired. Breakfast at the Greene farm finds the Group eating pancakes and eggs together peacefully. 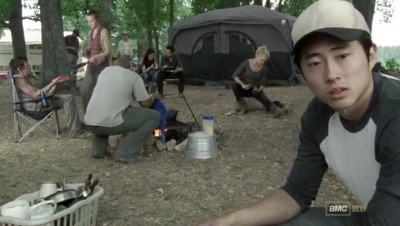 Despite Maggie's pleas, Glenn informs the Group that Hershel's barn is filled with Walkers. After learning the news, Shane demands that the Group abandon the search for Sophia and head to Fort Benning as originally planned. 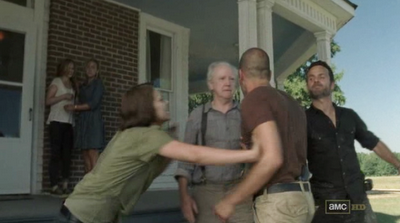 Daryl is enraged at Shane's callousness and a fistfight between the two men almost erupts. 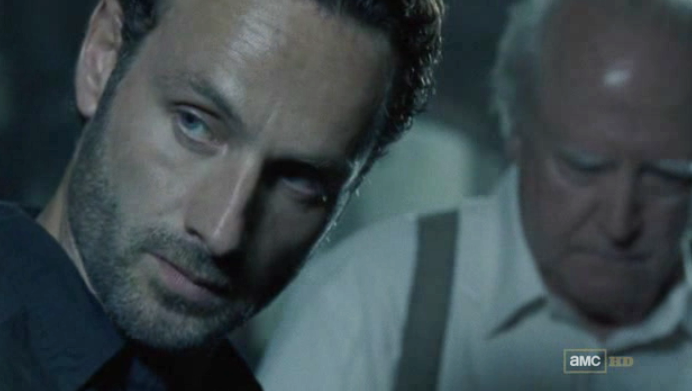 Rick assures the Group that he will discuss the situation with Hershel and make it right. 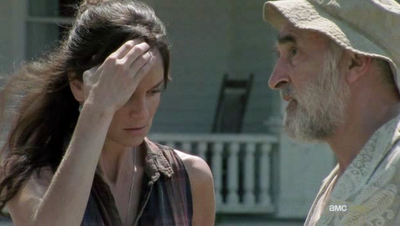 Lori's pregnancy makes it critical that the Group remain at the farm so she can receive medical care from Hershel. Rick is forced to reveal the pregnancy to Shane to win his cooperation. But Rick's discussion with the older man fails. Hershel's wife and stepson are infected and among the Walkers in the barn. Her insists that a cure will be found to restore them. 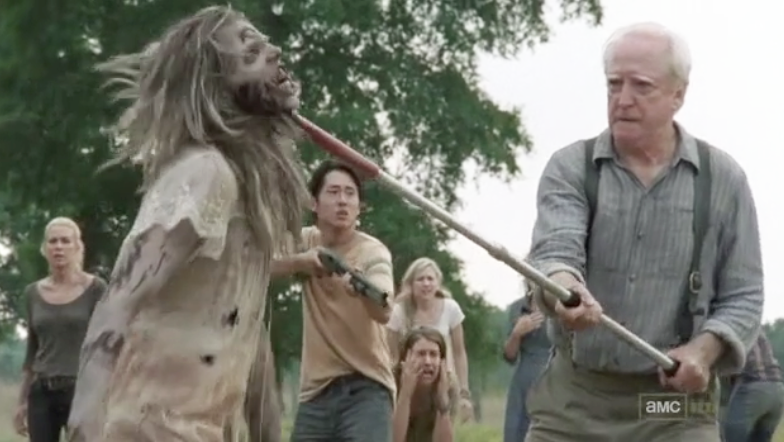 Later, Hershel learns that two Walkers are trapped in the swamps near his farm. 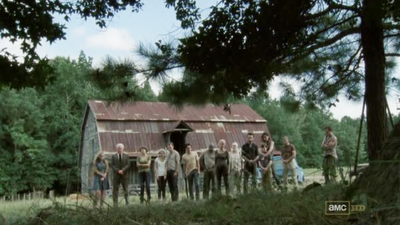 In exchange for Rick's cooperation in capturing and keeping the Walkers, Hershel decides to allow the Group to stay. The two men snare them with snare-poles and drag them back to the barn. 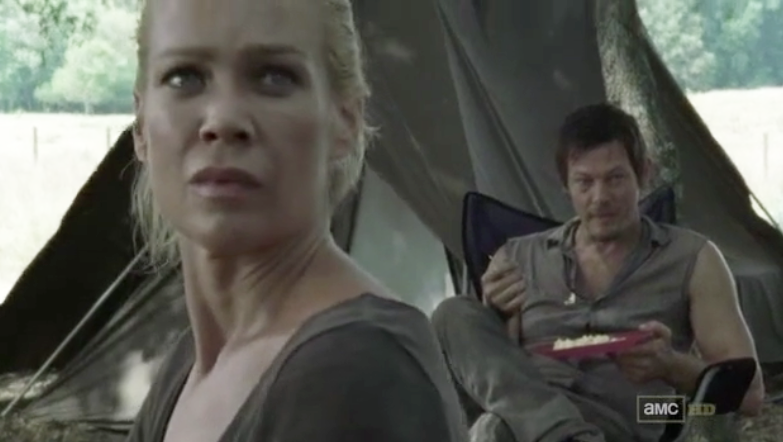 Shane is incensed and shoots both Walkers. 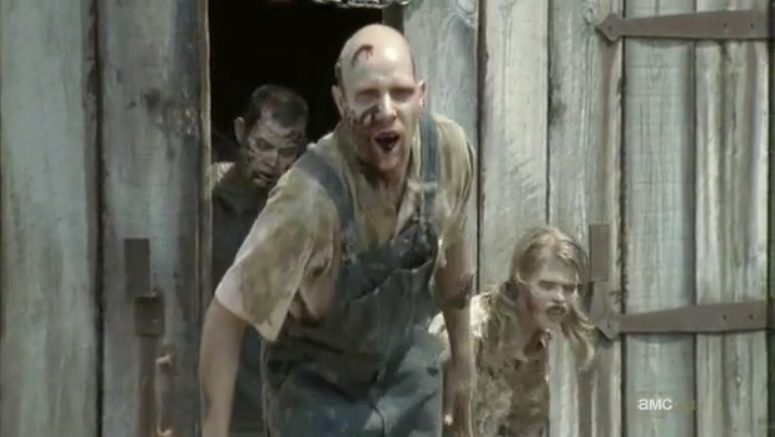 He storms the barn and breaks open the door, allowing the Walkers to swarm out. 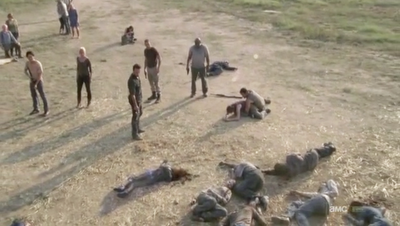 Rushing forward, Shane, Andrea, Glenn, T-Dog and Daryl open fire on the small herd and wipe them out. 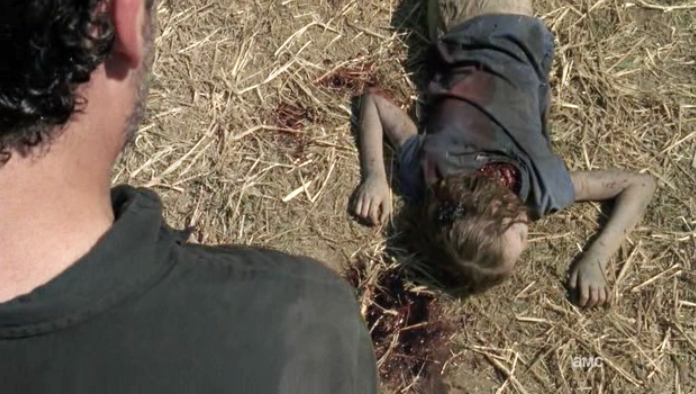 But the quiet is short-lived when the staggering form of young Sophia Peletier emerges from the barn. 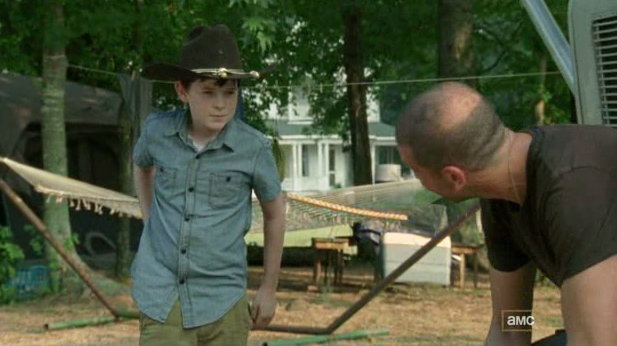 Rick has no choice but to put down the little girl. The last moments of peace that the Atlanta Survivor Group enjoyed were with breakfast. Pancakes cooked in a cast iron skillet over an open campfire and eaten with the people you care about most, make for the best meal anyone could hope for. And when the dead rise; don't go in any barns. Place a cast iron skillet or Dutch oven over medium coals or medium heat on a stove. Heat a tablespoon of vegetable oil or shortening until melted. 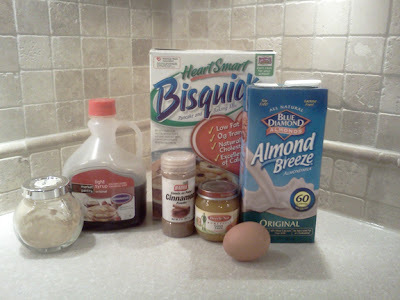 Combine all pancake batter ingredients in a medium bowl. Stir until moistened. Do not overmix batter. Pour about 1/4 cup of the batter in the center of the hot, greased Dutch oven or cast iron skillet. Cook until golden and dry around the edges with bubbles forming in the center. Flip over with a large spatula and brown the other side. Repeat with remaining batter until all the batter is used. Keep warm on a plate covered with aluminum foil or a lid. While pancakes are cooking, combine ginger syrup ingredients in a medium saucepan. Cook and stir over medium coals or medium heat until bubbly. 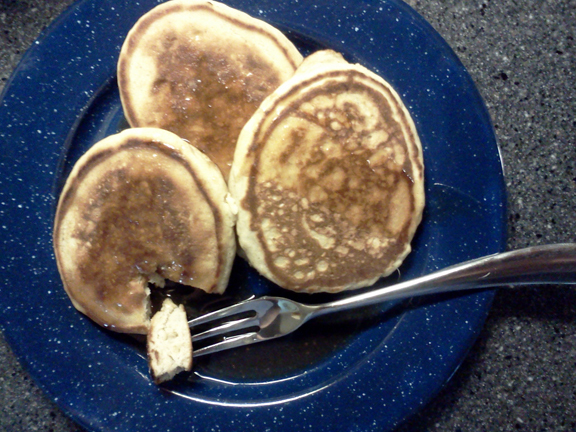 Serve over pancakes. This syrup is so flavorful you won't miss the butter! 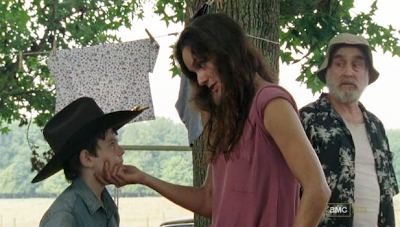 Carl Grimes and Sophia Peletier had the distinct disadvantage of growing up in the violent aftermath of a Global Apocalypse. Although they both managed to escape Atlanta with their parents and the rest of the Group, the situation quickly became even more dire. 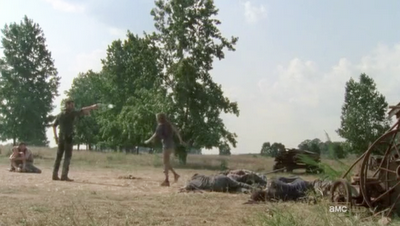 Sophia's disappearance and Carl's gunshot wound force the Group to halt at the Greene farm. 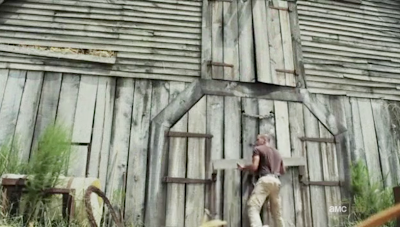 Although the farm enjoys relative security from the threat of Walkers, dangers still lurk. There is an excellent argument to be made that the only thing Carl and Sophia's parents had to do was keep an eye on them. Although not a parent himself, Daryl Dixon shouts this very same accusation at Carol Peletier. 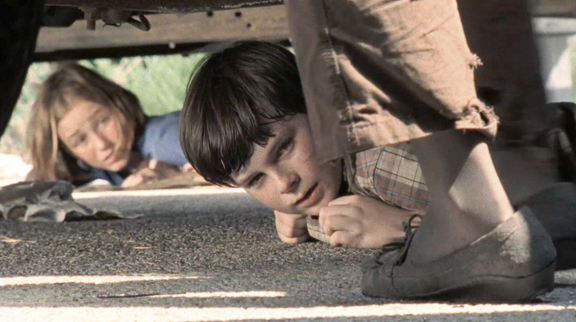 After surviving a gunshot to the abdomen, Carl wanders off on numerous occasions. And not once…but TWICE…steals a handgun. The WDSCB is certain that the children in your Group are adequately supervised. We offer one excellent product suggestion for those Groups that experience difficulty in managing their minors. For the Groups that balk at leashing their children, the WDSCB suggests cooking activities. Most children love to help prepare food. Especially if the food contains refined sugars. 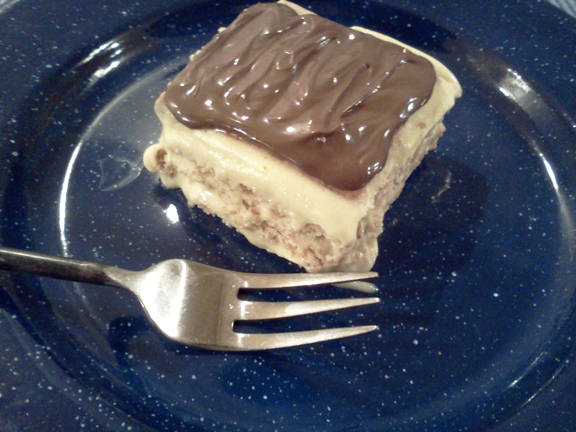 Eclair Cake is a perfect recipe to keep your Group's children occupied and close to camp. With only five ingredients, they'll stick around your campsite, not only to assemble the cake, but to enjoy the final result. Grease the bottom of a 9" x 13" pan with butter flavored shortening. Line pan with whole graham crackers. In a medium bowl, combine pudding mix with 3 cups of milk. Stir well until pudding thickens and set aside. In another medium bowl, combine remaining 1 cup of milk and 2 envelopes of Dream Whip. Using a wire whisk, beat well until mixture becomes somewhat fluffy. If you have access to electricity, you may use and electric mixer and beat until peaks form. If not, the wire whisk method will work fine; it will just not be as fluffy. Fold gently into pudding mixture. 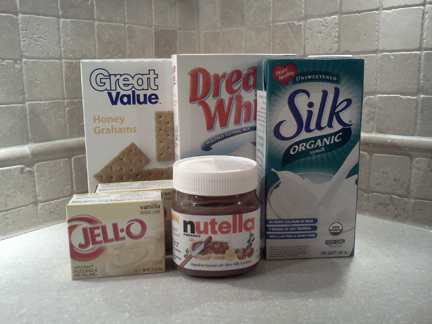 Pour 1/3 of the pudding mixture over the graham crackers. Place another layer of whole graham crackers over the pudding layer. Repeat, and end with a final layer of graham crackers. Let mixture sit for 30 minutes and then spread the entire jar of Nutella over the top carefully. Let sit for another 15 minutes to finish setting. Cut into squares and serve. The morning after the awkward dinner finds a tense Maggie trying to convince Glenn not to reveal the existence of the captive Walkers to the Group. She makes her case and sweetens her request with a gift of peaches and jerky. 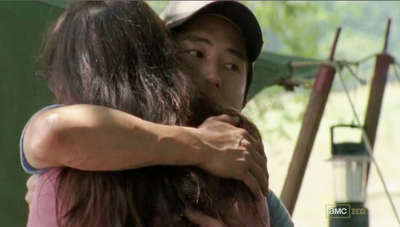 In addition to keeping the secret of the Walkers in the barn, Glenn is also burdened with the knowledge of Lori's pregnancy. Andrea brings Daryl a book to keep him occupied during his recovery. She offers her apology and though she does not expect forgiveness, Daryl freely gives it. He too believes that protecting the Group always comes first. 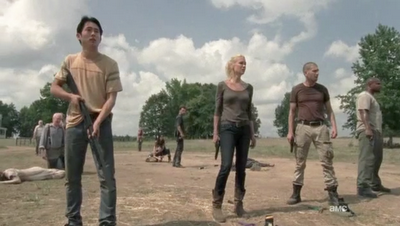 Rick decides that the entire Group must be trained in the use of handguns. 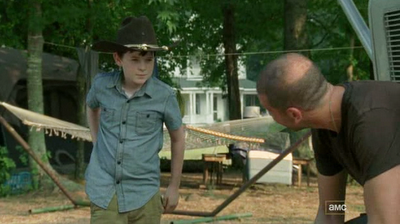 Shane takes charge of planning the training class and Carl approaches him with his request to join. Shane learns that the boy has stolen a handgun from the weapons cache in the RV. He immediately tells Lori and Rick. 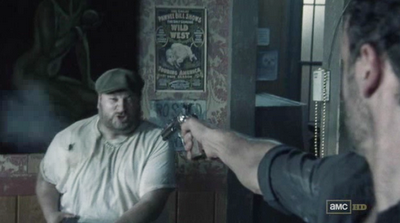 Though upset, the couple decide that Carl should have the training necessary to handle a weapon safely. 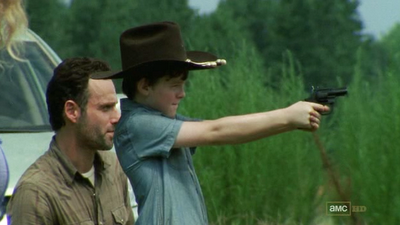 Shane conducts the gun class and Andrea becomes his star pupil. 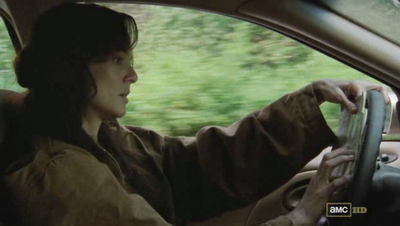 While the class is in progress, Glenn makes another pharmacy run on Lori's behalf. She asked him to find her medications that would end her pregnancy. Lori also discovers that Hershel expects them to leave after Sophia is found. 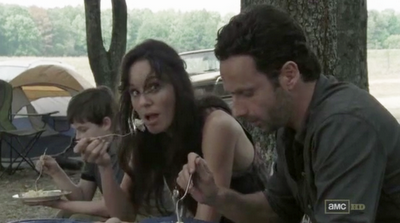 Upon learning of her pregnancy, Rick tries to convince Lori that he can keep her, as well as the Group, safe. With an unplanned pregnancy, a missing child, and a burgeoning mutiny, the Group needs all the luck it can get. 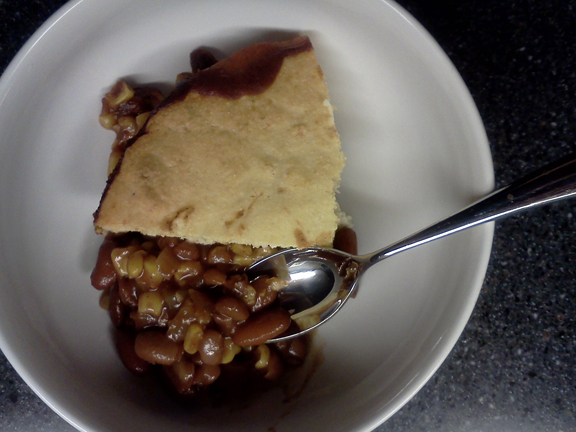 Hoppin' John and Skillet Cornbread is a Southern dish traditionally made and served on New Year's Day and is thought to bring good luck. Hopefully your Group is faring better than the Atlanta survivors and does not need to even believe in luck. Regardless, it is still a delicious and healthy addition to your Group's menu. It is an especially frugal recipe since Dale had fried SPAM for the Group's lunch. 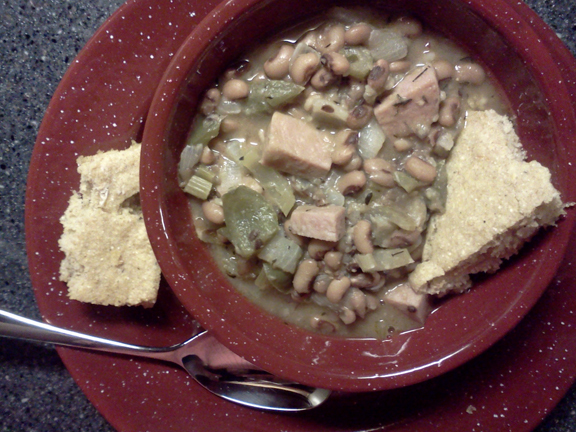 Hoppin' John makes good use of the leftover SPAM so there would be no waste. The leftover Hoppin' John is called Skippin' Jenny. And when the dead rise; don't trust Patricia with your chickens. In a large Dutch oven, heat a tablespoon of oil over medium heat or medium coals. Add onion, celery, pepper and garlic. Cook stirring often for 7-8 minutes until onion is translucent. Add black eyed peas and 2 cups of water and bouillon cubes. Stir in bay leaves, thyme and cayenne pepper to taste. Bring to a low boil and cover.Cook for 20 minutes or until vegetables are softened. Add cubed SPAM or Bacon Salt. Cook for an additional 10 minutes, stirring constantly. Taste and add Kosher salt and black pepper to taste. Add cayenne pepper to taste, if desired. Preheat oven to 500°. Or have medium to hot coals ready on your campfire. Grease a cast iron skillet with 2 Tbsp. melted shortening. In a small bowl, combine the vinegar and soy or almond milk. Let sit a few minutes to allow the vinegar to thicken the milk. Blend in egg. In another bowl, mix cornmeal, flour, baking powder and salt. Stir in wet ingredients and mix only until moistened. Pour batter into greased skillet. Bake in preheated oven for 12 minutes or until top of cornbread springs back when lightly touched and the color is golden brown. 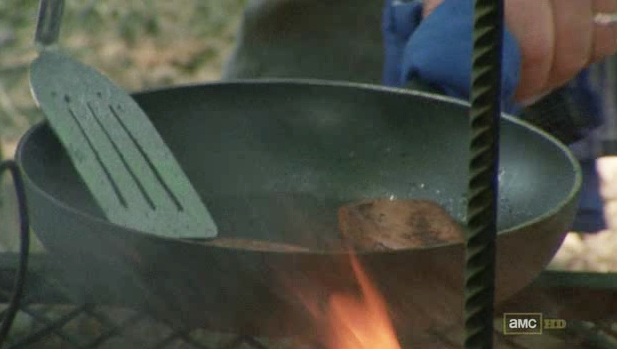 Alternately, place skillet over campfire and cover tightly with foil or a tight-fitting lid. Allow to bake over coals. Cornbread will not rise as much and will likely be finished in 8 minutes or so, since the heat is direct. Check often. Invert onto a plate and slice into wedges. Serve hot with Hoppin' John.